@Bartrcm: Congratulations! :) Champions and EL-winners. And your youth intake does look very promising. Thanks. All my facilitie are almost maxed out. So I will save a lot of money. 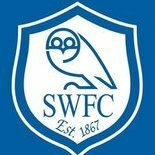 May announcement from the board, they are expanding our 3,000 capacity stadium by 1,740 at the cost of 975k (which we cannot afford and just saddled us with repayments for 5 years!) and will take a year to complete. For next season we will share the 34,500 capacity stadium of Nueva Espana! A lovely start to the season on the pitch, winning all of our first 3 games, including a 5-1 spanking of Temperley at their place! 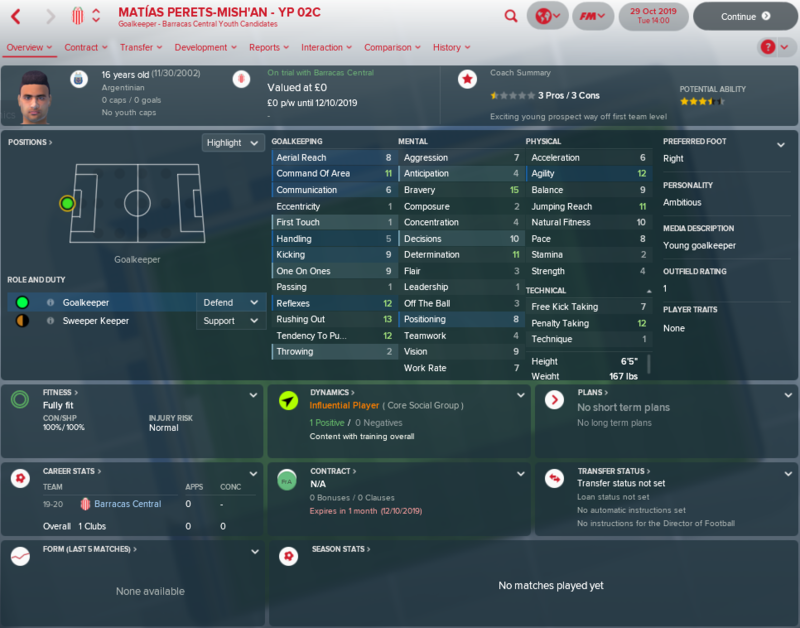 Matias Perets-Mish'an – YP 02C – A high potential GK is always a good thing! Holy smokes this season is a slog! 6th week in a row with weekend / midweek games. Another 2 weeks of this to go before we get a 'break' (no weekend game) and then back at it for another 4 weeks! Getting used to squad rotating! Ok, lesson learnt..... There are a couple of youths from this years intake I want to start giving sub appearance to. In Argentina you get to name a 40 man squad, but youth players can play without being registered. However, once they sign their full time contract, they no longer qualify as a youth player and have to be part of the 40 man squad.... So now I must wait until the transfer window to sell a couple of fringe players to free up spots to then register the kids (I gave the 4 main kids full time contracts from the get-go). From next season on, they all get their 5 pound a week youth contracts until Xmas when I can register them and THEN they get their full time contracts offered! Last year our league season was 24 games. This season we are about to play our 24th game and it is still a full week before Christmas!!! 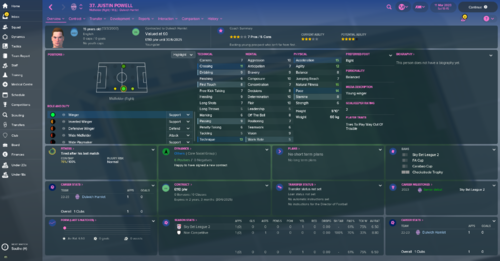 January 2nd 2020 and the Chinese are back for Sproat..... His value is 800k and that is what they offer. We negotiate 4 times and I got them up to 2.1m, but 525k of that is based on 50 apps for them, which basically means a 1.6m offer. I reject. Not sure what the deal is a couple of days later, but I had the option to confirm or cancel the transfer that the board had accepted..... I canceled. 2.5m is obviously a great deal, but it would not get me in the black at anytime (due to the installment nature) and therefore not allow me to get approval on any improvements! The transfer saga seemed to have an impact, we went 10 games with just one win. The 4411 just felt flat. With our excess of central players we switched to a 433 for a cup game, figuring if it stinks we can switch back and it has worked a treat (at least for now) 6-1!. 6 wins in 9 to finish the year. A 6th place finish is an improvement on last year and by the end of the year I was able to fit more youth players into the new formation and kick start development. 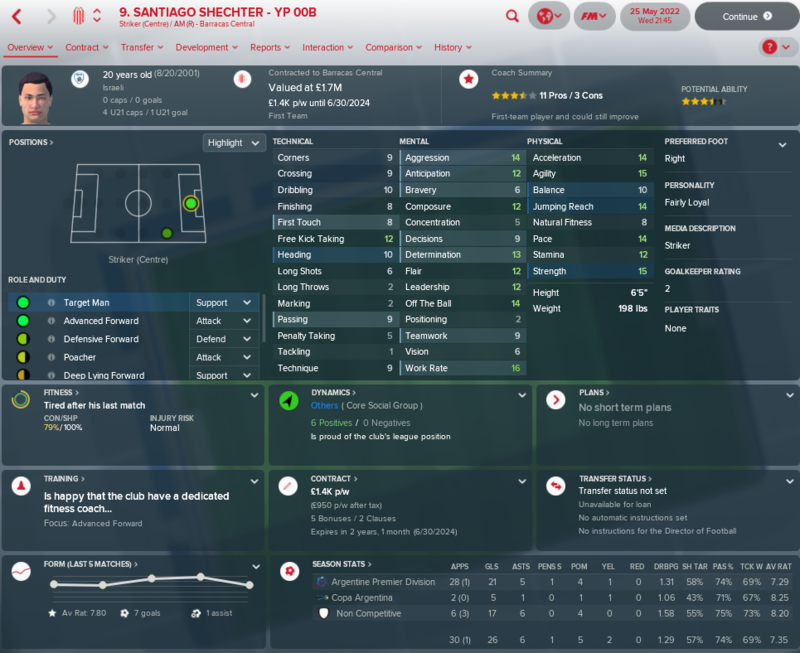 Tinkered with the new tactic and now have 6ft 5in Santiago Shechter - YP 00B in the middle as a Target Man. 4 goals to sign off the season (he was injured for the cup game)! Let's hope that the stadium will be large enough. I had the same in my Billericay game, but haven't heard a thing since and I am part way through the next season. @Bartrcm Congrats on the tittle. And the Europa League. An up and down season that started well but ended with only one win after the 14th November. I seemed to make it to the 60 minute mark in every game and then fall apart. I ended up in a playout with Mestre and managed to win 2-0 at home and 1-0 away to survive. Obviously, no transfers were made. The squad is ok, a couple of the star defenders are so old they have 4 or 5 pace. They were dropped by the end of the season because this was proving to be a liability and I'm hoping they retire so they're not bringing the mood down stuck on the bench moving forwards. Competitions: We adapted to the league a lot better than I was expecting, and started the season very well. We had a dip in form after this, but then stayed pretty consistent for the rest of the season. We lost both of our keepers around halfway through the season which was a big setback, but we finished the season with a couple of wins and ended in a fantastic 4th place. In the first play off game we were at home to Lincoln, and we absolutely dominated the game, but they scored twice from corners and came away with the win. Talk about smash and grab. In the FA Trophy we made it to the semi-final against lower league Bath, but we bottled it over two legs and they went through. 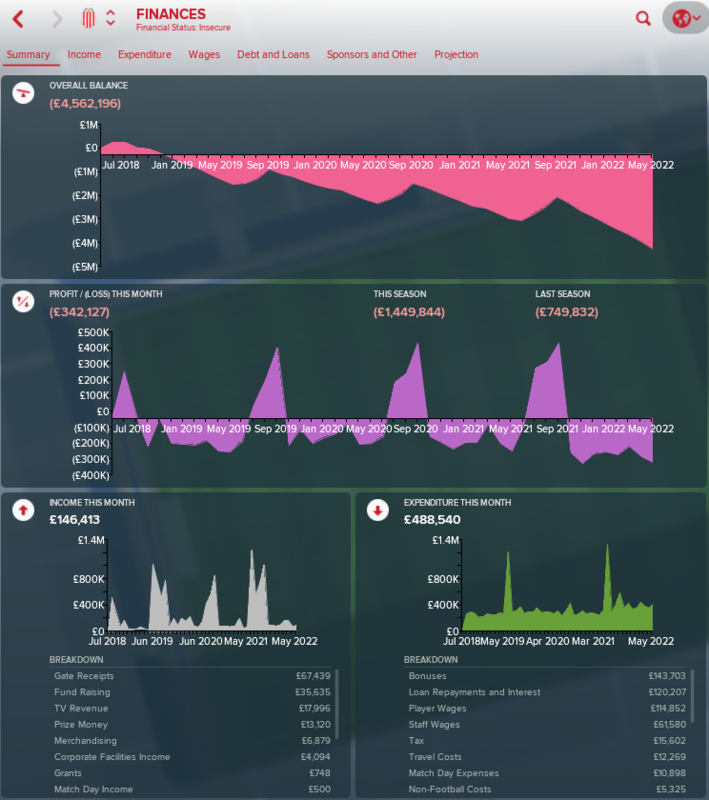 Finances: Our board decided to sell one of our prospects which brought in 300k to add to the finances. Upgrades: Just youth recruitment I think. Youth intake: Probably the worst one yet, but a couple of players who should make it into the first team. Lucas Beale 5A looks a nice addition at right back, Tom Holmes 5B will be trained in my poacher role, and Chris Desormeaux 5C could be a decent cb if we can up his pace. Overall: A really solid first season, but so disappointing to lose like that in the playoffs. Phil Bale 2E and Adam Freeman 3A were absolutely lethal upfront, with Freeman finishing with 40 goals in the league. Both players got senior international call ups which is insane, and Freeman actually got a cap. 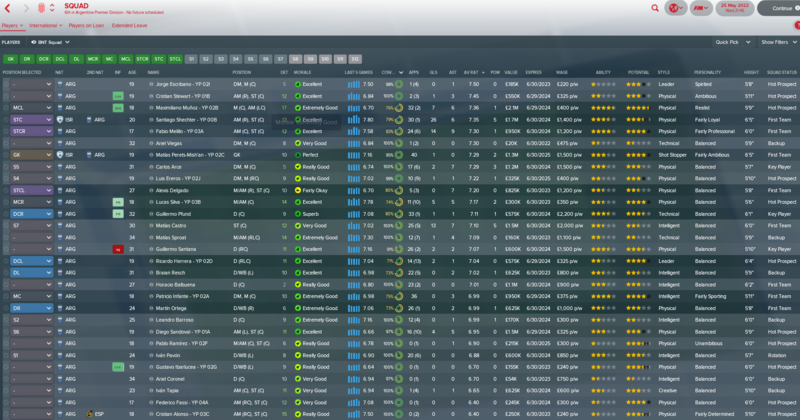 Unfortunately Bale 2E and Charlie Hughes 2A left on free transfers, to Bolton and premier league Swansea respectively. Freeman only has a year left himself so he'll leave on a free next season too. We also had to play two games in two days over Christmas which was quite odd. Last season targets: try and stay up - safe to say we achieved this. Next season targets: After losing 2/3 of our best players next season will be tough, ill be happy with mid table. 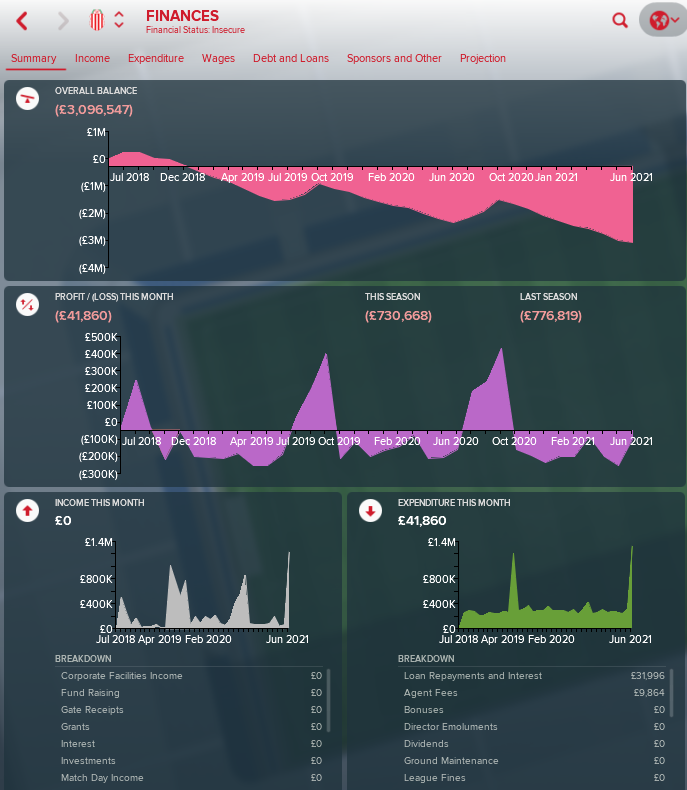 This is not a season update, just a notification that the situation at our club changed: we have been trough a Board Takeover after numerous failed attempts, and the new owners already started pumping money into the administration and transfer budget. Not sure what to make of this, as I never had a takeover in my previous youth careers. Hope just that the new owner is patient because it will still take a while for us to battle with Shaktar and Dynamo and reach Champions League football. I still haven't got last seasons update yet, having too much fun playing the game! 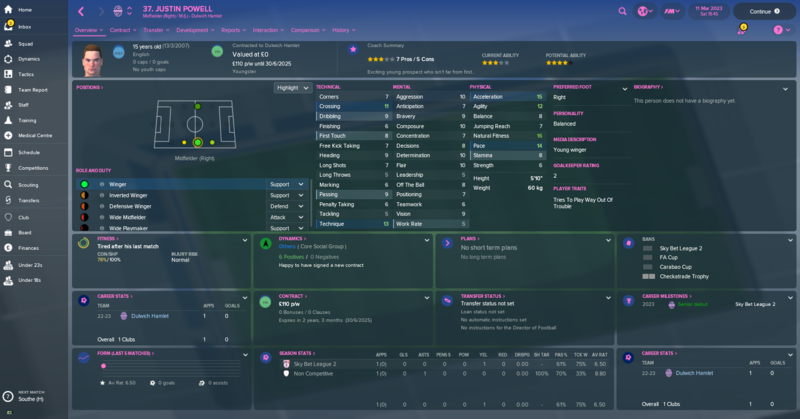 After 3 back to back promotions, my Dulwich Hamlet side were ill equipped for League 1 and came straight back down, finishing 23rd. Had a couple of decent runs but was just overpowered - players simply not good enough. 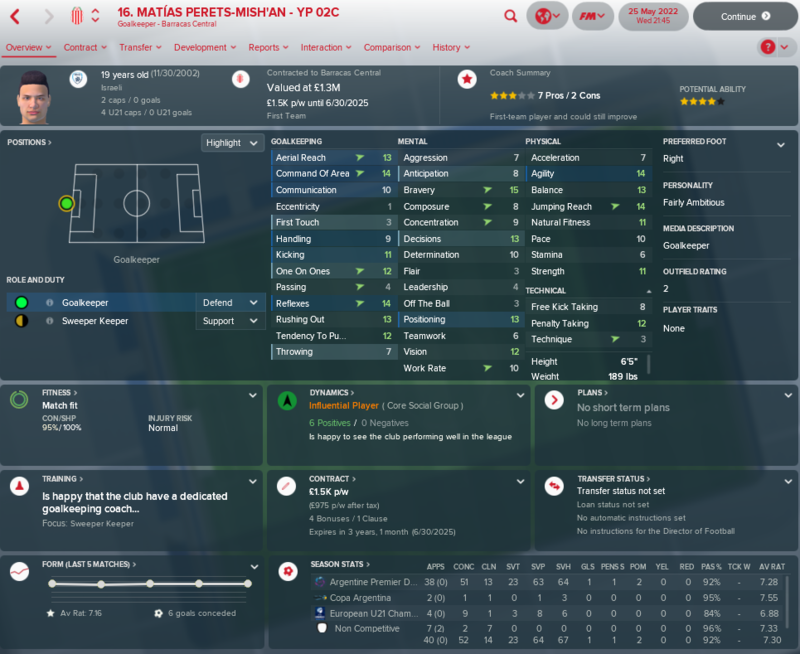 I lost my RWB to Nottingham Forest so had to play a 16 year old there all season, and am about to lose my CM, who is currently representing China in the 2022 WC but won't sign a new deal. I've got some really good players that are improving nicely, and hopefully I can come straight back up and be a better team in League 1. I didn't take screenshots of the cups because.....well it was non existent to be honest. Won 1 game in the League cup group stage but was out by the time I played my final game. Challenge cup I was put out by Peterhead and while I beat my boggy team Clyde in the Scottish cup (I'm starting to really hate Clyde btw, nothing personal but at the end of the season I had played them 14 times, lost 10, drawn 3 and won only once) I was soundly beaten by Dunfermline in the 4th round. The league was pretty much a slug fest, spent most of the time in 7th place but as soon as the final stage came into view, the arse end fell out of my team and with 4 games to go I was sitting in 10th and looking likely to drop, my form was bad. Thankfuly, Arbroath's form was worse and I sneaked into 9th place at the end. So Annan in the semi final and a solid, if not spectacular 1-0 win setup what could have been a tense 2nd leg...however a good and attacking first 30 mins saw The Spartans 3-0 up before rounding out a 5-2 home win winning the leg 6-2. Annan had one of our original youth players, Gary Page YP01 on loan from Hibs, but we were more than good enough to keep him quiet. The final would be against Cowdenbeath with us being at home first we secure a rare clean sheet an a solid 2-0 win, the return leg started badly going a goal down within the 20 mins, but a quickfire reply quickly stopped any potential momentum for the opposition and we see the game out 2-1 winners, 4-1 on aggregate. Overall, it went as well as I could have hoped for. Having to through the youngsters into or back line was not ideal and they made a number of basic errors which was to be expected, hopefully they learn from this and we can be a bit more solid at the back. I'm going to be screwed for goals when Ali Sutherland goes, although at 25 he's still got a couple of years left....hopefully with us and not someone else. Intake - Another nice batch with plenty of potential, but potential is one thing, achieving is another. I've got a bit of depth now so I can be a bit more selective, in saying that I think I signed all but 5 from the intake. Will have to farm a few out on loan next season otherwise there could be wasted talent (or in the case of young Scottish players, they find the joy of Guinness and Kebab's.....I know I did) I few stand outs to look at. At the end of the season I felt I needed to start changing things around, I let go my Head of Youth and welcomed Derek Ure to the club, the JPA & JPA stats are almost double of the previous HoY and I've signed Derek on a 2 year deal so we'll give it a go and fingers crossed I see an improvement....not that I've had a particularity poor influx over the seasons. Transfers - Fee & Released players. I sold Mark Dickson YP02 for £80,000 with a 50% sell on clause to Killie during the winter transfer window. I had a decent back up that I could bring in so take the money when I can. 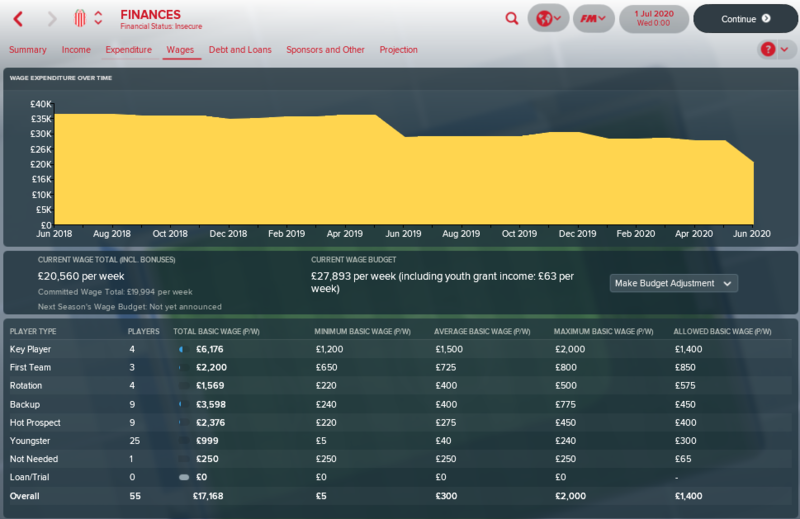 There is a lack of money in the Scottish League's so got to take the chances when it comes, that 80k covers at least 4/5 months for my Youth Setup. At the end of the season I got onto the board regarding getting some coaching badges and they agreed so National A badge, here I come. Got a number of job offers over the season, the biggest being Aberdeen thing must be bad over at Pittodrie. @Dan BHTFC - What kind of deal did you have to do with the devil to get Robbie White in....and how long can you keep him? @Bartrcm - Congrats on the win and Europa glory, the money is going to be invaluable for the next couple seasons to keep building. League (2nd) - Promotion! Very happy with the way the season panned out. We took our form at the end of the previous season and just carried on for a year. Defensively tight and impressive going forward, it was a shame we missed out on the title due to our results against eventual champions Rad. We finished the season on 63 points, averaging over two points a game. This result in the previous three seasons in the First League would have given us the title at a canter. Serbian Cup - 1st round. Again. Losing on penalties to a Super League team. Again. Pavle Radunovic - Most goals (12), most assists (13), highest average rating (7.74), and most MoMs (10). Needless to say he was voted First League Player of the Season. If he's half as decent in the Super League I think we have a good chance of staying up. Other notable mentions would be Vasilije Djuric who was outstanding in centre midfield, and Dejan Resanovic, who although isn't outstanding, is our captain and has been a rock at left back for my three seasons in charge. A steady 7/10 player every game. Transfers - Not much movement. Unfortunately I lost a good young defensive midfielder in Stanko Jovcic 1c at the start of the season. 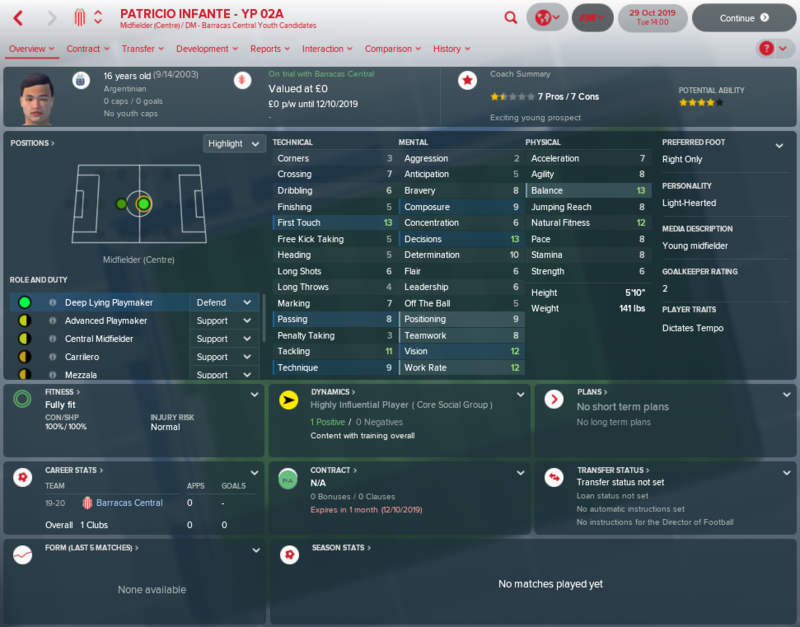 However Partizan paid an initial £300k (which could rise to £800k + 15% of the next profit) to acquire him. Considering he was only worth £8.5k at point of sale I'd say that's not bad a deal. 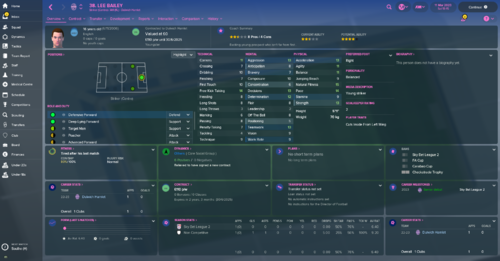 Youth Intake - Very pleased this year. Good potential, but two of the players are good enough for the first team now which is great. The star man being the central midfielder, with the keeper not looking too shabby either. Other - A small stadium expansion is on the horizon providing I can keep the team up at the first attempt in the Super League, in order to meet league requirements. Due to the sale of the promising youngster above the board improved our youth recruitment and allowed my manager to study towards a National A badge. Cheers lads! Next Season - Please let me stay up. That's all I want. I'll take a final minute goal in the final game again if it's guaranteed. Looking forward to playing another batch of teams who's names and players I can't pronounce. Unfortunately I'm not off to a good start, currently in pre-season but it looks like Matija Mrkela and Vasilije Janjic are about to leave imminently at the end of their contracts. Mrklea has been unhappy for some time, and although he's not a regular he would have been useful as backup. Janjic is a killer though as he's a very good player. He was unhappy early in our promotion campaign as he wanted to move to a Super League club. Now we're in the Super League he's decided he hasn't played enough games (Djuric was very good this year) so wants a fresh start. Gutting as he would have been useful in the league above. 2018/19   First League   12th	 N/A		1st Round	    Avoided relegation on final day of season. 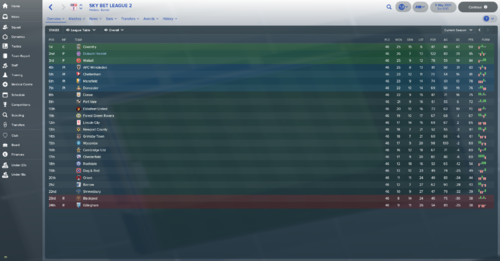 2020/21   First League   2nd     N/A            1st Round           Promoted as RU. Manager of the Year RU. Season   Finances  Balance Sheet  Reputation  Av. Att  Capacity  Stadium  Pitch      Corporate  Training Facs. Youth Facs. Jnr Coaching  Youth Rec. And I finally managed to get the players on my side! 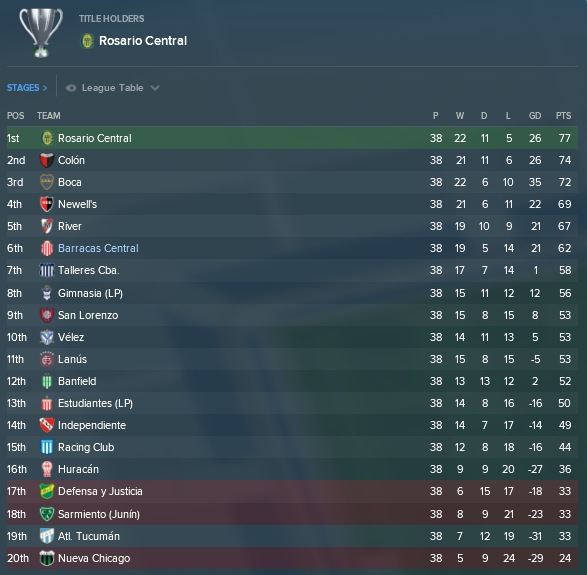 At the end of last season I was feeling optimistic of a strong push for the playoffs, with maybe an outside chance of promotion. In reality, we just didn't have the talent to maintain anything consistent. We managed to string together a couple of decent unbeaten runs, but always they were followed up with back-to-back-to-back (-to-back?) defeats. The truth is, our squad is just not good enough and it resulted in a 9th place finish. Last season's youth intake have all made appearances throughout the season, but none of them really have the potential to go on and make a name for themselves, with only one player having higher than a 3 star potential ability. Add to that the club's still amateur status and there's no chance of any of them ever really developing into anything useful. This season's youth intake is really much the same, with only Syd Baxter having any real potential. Although most of the intake have signed, it's unlikely that they'll feature unless/until the original crop of players have started to retire or choose to move on. We are desperately in need of someone coming through that might look to improve on what we currently have. The biggest obstacle thus far is definitely the club's financial situation. Currently just over £100k in debt and with a projection heading towards £2m debt in the next three years, we need to find a way to earn money. Professional status has to be the first step on that road, but understandably, the board refuses to make any investment while there's no sign of any money coming in. Likewise their stance on improving any part of the youth setup. As yet I've been unable to get them to agree to anything beyond stepping up the junior coaching level. I feel as though we are stuck in limbo and the only ways to improve it (as far as I can see) are either a decent payout from a cup run or a board takeover and cash injection to allow the improvements we need. With the potential abilities in the squad and the slow aging of the senior players, I reckon we need to get some serious cash within the next two seasons, or we'll be left with a bunch of 2 star youngsters and probably drop out of the league. Next season's ambitions: To bag a decent cup fixture, to bring us into the Black and maybe sneak into the Playoffs. Contract renewals took quite the while this close season and there was news out of it. Milton Alvarez, our first choice GK for the past two years would not renew as he didn't think our squad was strong enough... Time for our youth GK from last years intake to rise up! A simply fantastic start to the season. 1 loss in our first 21 games! 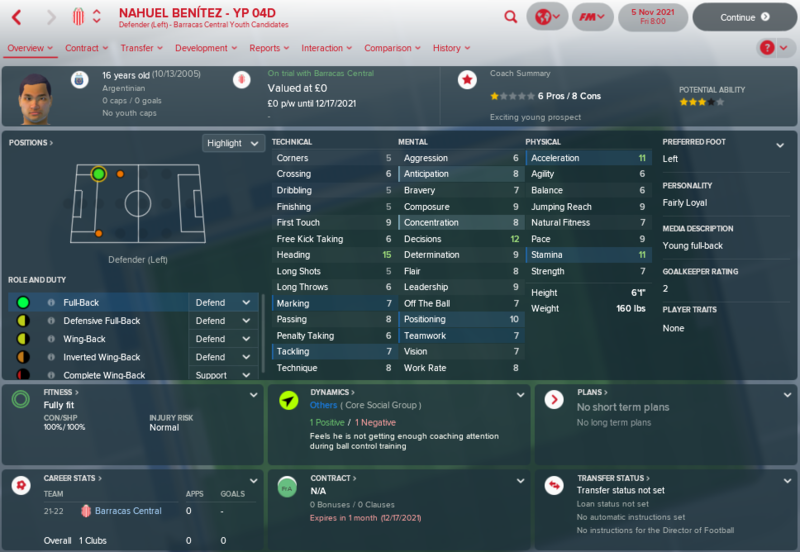 Youth Intake Day! Another promising looking bunch of kids, and again, very offensive minded. Jonas Varela – YP 03D – We just abandoned our winger system, so will work on his flexibility and retrain to MC. A great wide option for when we need it. 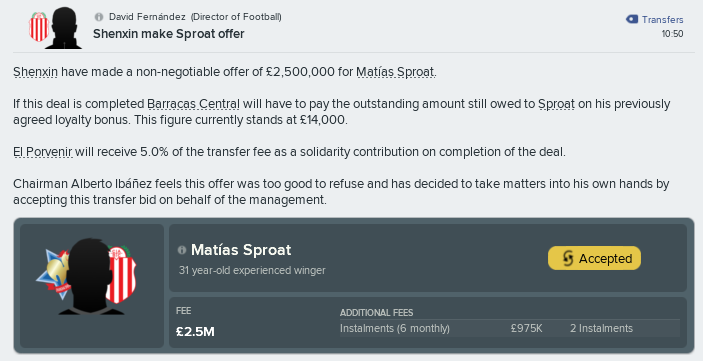 January rolls around and that means the annual Chinese bid for Matias Sproat! This time just a 525k offer (his value) and when I try to negotiate it higher they walk away and do not come back. Oh well. The second half of the season is a nailbiter. We claw our way into 1st place for 1 week, then stay in 2nd. Slip into 3rd for 1 week and then back to 2nd again. The mass of first half of the season draws run dry and we win more but also lose more. A penultimate game 4-1 win at home seals 2nd place and promotion! 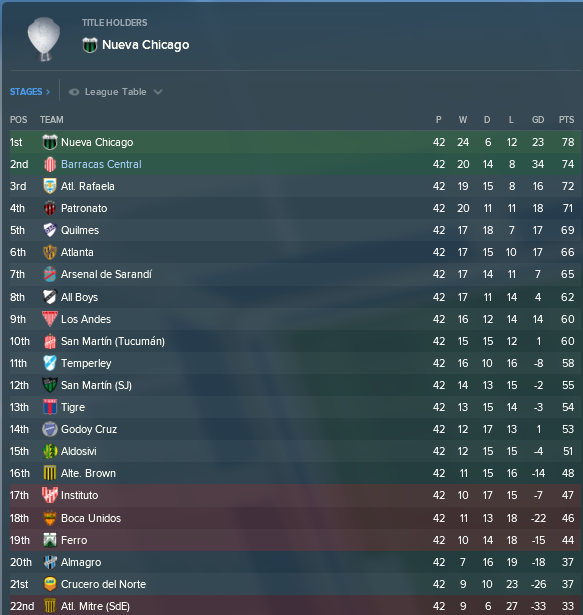 Last game of the season and we could still win the league with a win and Nueva Chicago slip up. But alas, nope. Santiago Shechter - YP 00B - Switching between a Target Man and Advanced Forward role, Santiago led the line very well. He is still inconsistent, going stretches without scoring, but when he hits his stride he is a handful! 6ft 5in and very fast for our level, he can be formidable. Simply, survival! 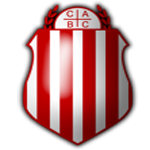 The Argentine Premier Division is now down to 20 team and the bottom 3 (on average points per game over the last 3 seasons) are relegated. 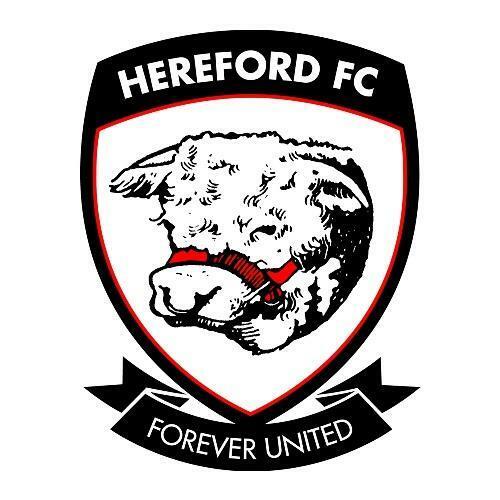 First news item after the season ended – new stadium announced! The figures here are wonky to say the least. We get 2,500 for selling the old stadium...... I need to start buying up real estate land in Buenos Aires. The Slovenian side were just too strong for us but we are learning! We turned Full-Time at the start of the season so the pressures of a higher wage bill are showing but at least we aren't in loads of debt. Jonathan Thomas and Ross Hooson are the best products by a mile! Again I will try to complete the challenge with East Stirlingshire in Scotland. Don't know if it's a bug or a mistake in the simulation from my side. Instead I will try out with Merthyr Town in England. Again lots of goals, but I couldn't stop the rot. Transfer wise I've been pillaged, lost Dean Gibson (YP19b) for £170k to Forest and now have lost Jason Beggs (YP19a) for £250k to Hull, Tang Weijan (YP19d) for £70k tribunal to Fulham and Alan Booth (YP20b) to Middlesborough for £250k. It's really frustrating but not much I can do. I have broken the rules of the challenge by signing someone - myself! I am a potential regen in the game and turned up in my game, I was released by VNS side Dartford without making a senior appearance and thought he was terrble enough for it to not matter - I doubt he'll ever play for me but just nice to have me in the squad. 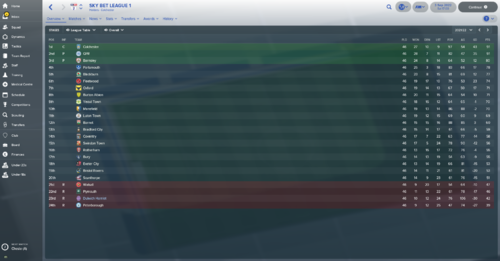 Despite all the sales, finances aren't the best - facilities are good and I have had a Golden Generation every year, but keeping hold of players is proving very tricky - the last relegation really set me back, had I stayed up I know I would have been able to keep hold of both Beggs and Booth who were both quality and improving so quickly. 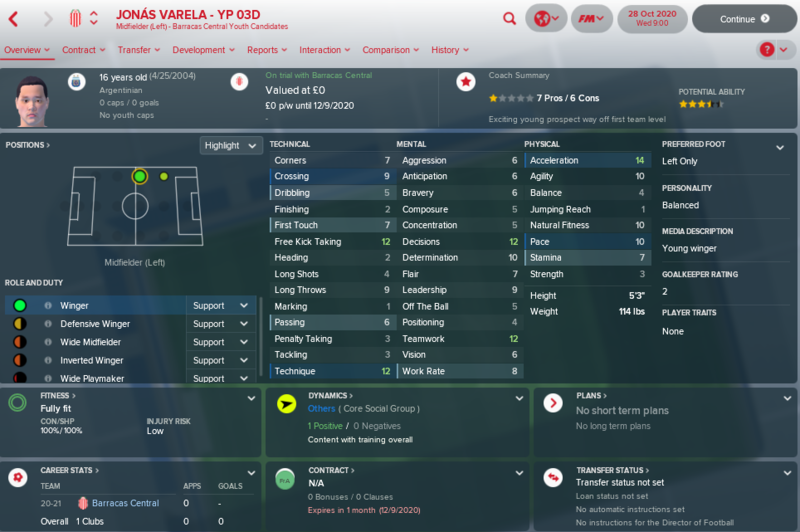 Onto 2022/23, and hopefully I can bounce back up despite having no decent Central Midfielders any more! 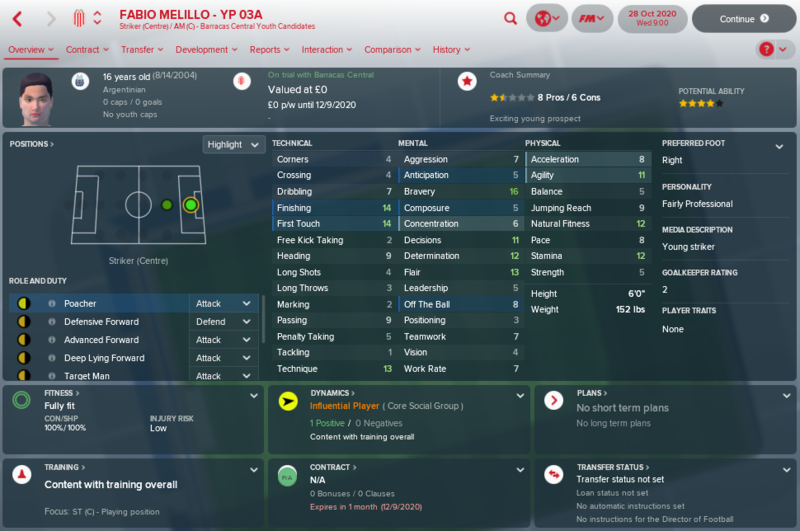 I had to play the first year without a youth setup but got the option to join the development league after my first season. I've not really looked into too much but it may be a bug. 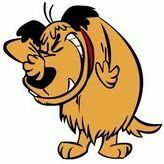 It may be also that the game is accurately representing the incompetence of the SFA, who now decide how the unholy mess of a development league is set up under the rather bewildering tittle....and I wish I was making this up...."Project Brave". I may have let my own bias creep in there. Here he is/I am - have made a couple of appearances but his stats give him no right to be a League 2 player....! Board wanted a top half finish, we managed to finish 10th after an extremely weak first half. Got to stay around for another year - and have started to get the backing of the players - at least. Midfielder Timo Gebhart was our MVP for the season. Whilst the youth intake was good overall, three youngsters stood out: Henry Salz (ST), Frane Spanjic (DR) and Dursun Yilmaz (MC). I opted to sign the whole bunch though, since I was preparing to get rid of a whole lot of deadwood in the U21s by the end of the season. Even though my staff was talking about a golden generation I have much higher hopes for the youngsters I inherited from the 17/18 season. Many of them are top notch and will either make core players or (most probably) get sold by the board. Meet Juan José López and Rico Schulze, my future wing backs, Gerrit Langer and Cedric Brust who will make up the creative midfield, and the centre back pair Markus Tschauner/Simon Amonat. Wickid sik. Other players of interest are him, this fella here, this guy, a goalie and these two. All in all a decent season for us considering my sub-par tactical skills. 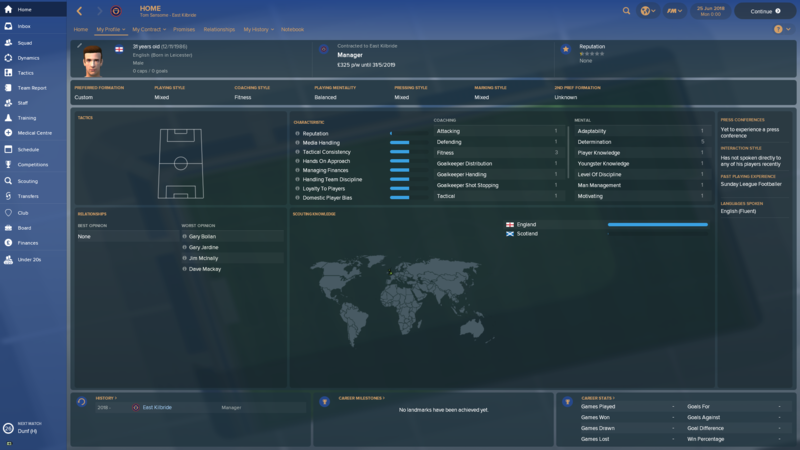 A new chairman was elected by the end of the season and he scrapped my youth development philosophy so I will probably have to put all nagging about facilities and junior coaching aside for a while. Doesn't really help that the club finances currently are in a state of complete decomposition either. So you won CL in just 6 years, with 4 players still in the team coming from the 4th league and the rest a bunch of youngsters all under 21? Surely the beauty of this challenge is that you don't need to bother with the scouting. 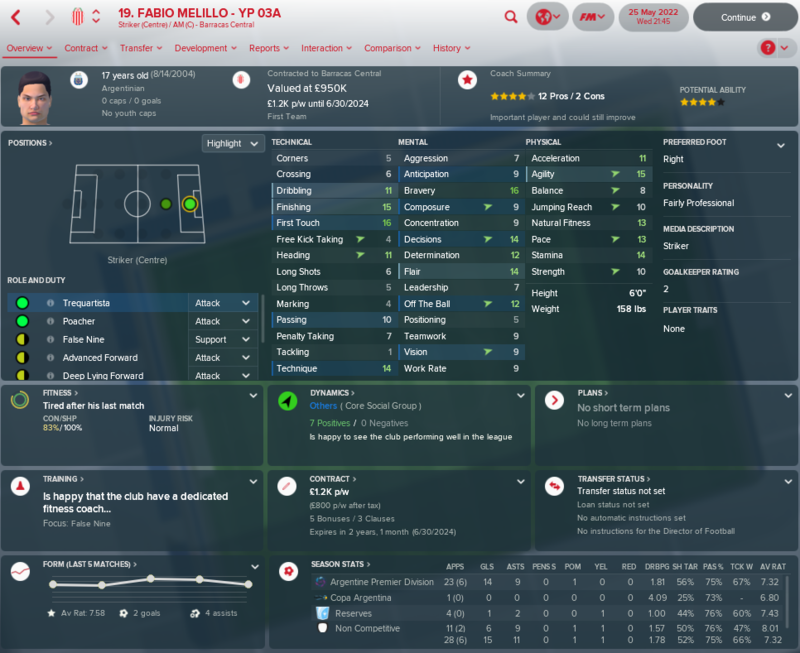 I hate it in FM18 too, but I'm only using one part-time scout to scout the next opposition. Otherwise, they're redundant. Decided to give this a go. I am going to manage in Norway and my club of choice is Lyn Fotball in Norway. Will update at the end of the season. I am also running a more detailed thread on the Careers Forum if anyone is interested and can be found here. After following for a while I decided to give a go and will head out to the north and Obar Dheathain. After two seasons waiting for a club to come up, McCormick take the reins of Cove Rangers. With a completely empty staff, it is perfect to set up people at key positions. A quick look at the squad shows that it is extremely bloated. Financial seem OK and the chairman green lights my first coaching badge. - Avoid sucking too much and stay clear of the relegation zone. - Reduce the team size to a manageable crowd. The season review shows a pretty solid year for Dnipr. 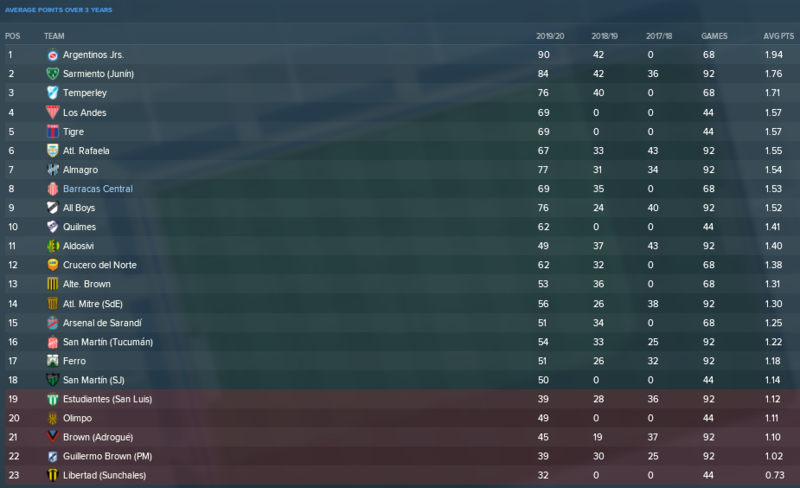 For a while we have hoped to battle with Shakhtar for the League title, but in the end they were to strong for us and we finished in 2nd miles ahead of Dynamo, which is still pretty good as it means CL qualifications next season. The same team kicked us out of the Cup and are proving to be a pretty tough nut to crack for us. 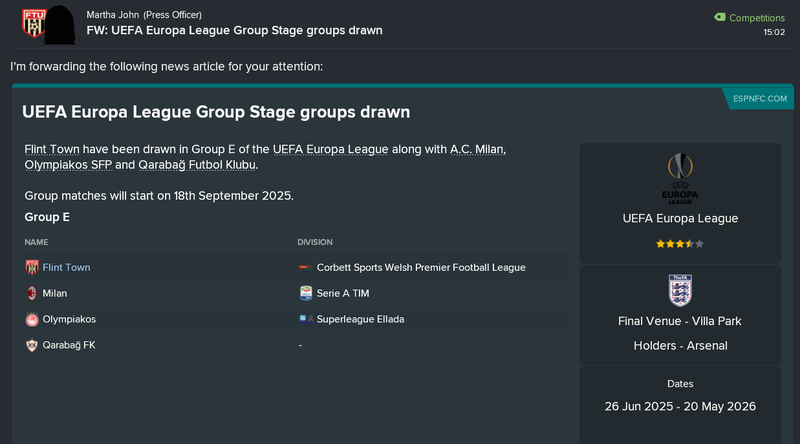 In the Europa League we went straight into the groups, but only managed to beat Slovan home and away which wasn't enough and we ended up in 3rd. 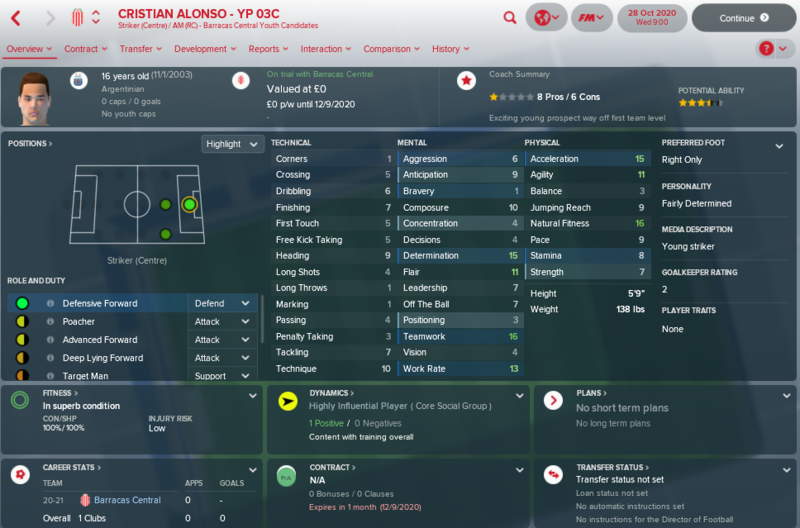 Only 5 original players left in the Team of the Season, but youth prospects were the best this year, as can be seen from the getting all the awards. Also, Jose 22a was the best scorer in the league and I have extended his contract just the next day and our rock of the back Palyuch (although he is rated low has proven to be valuable for us) was selected in the team of the season together with 9 Shakhtar players. Here are the players arranged by game time given to them this season, we really need an AMR. Our transfer show 4 players leaving on a free and a transfer for so good money. 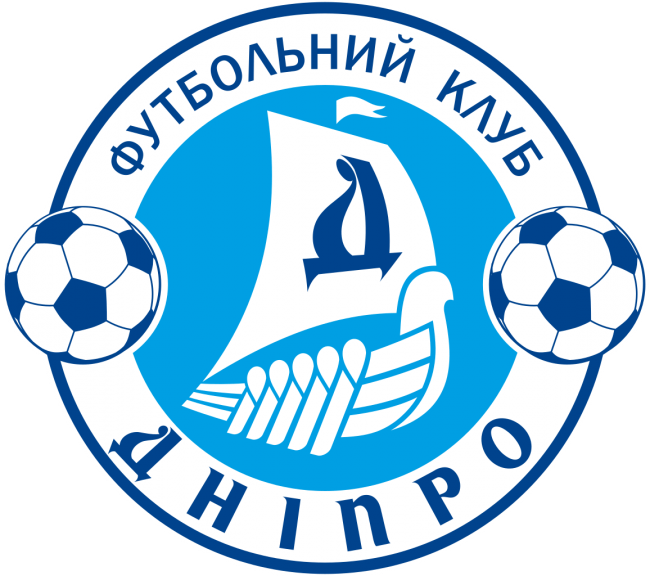 I have agreed to sell Basthanenko to Dynamo Kiev, the main reason being that we already have three promising youth prospects in AML and I want to give them game time. Plus, the money going are always good for the club. A decent youth intake although it has no less than 3 strikers which probably won't get much playing time with Jose getting to be so good. I have begun retraining one of them to AMR to fill that gap we have there. Our facilities somehow have downgraded this season and no option for another upgrade is in sight right now, but we did get a message about our youth development budget. 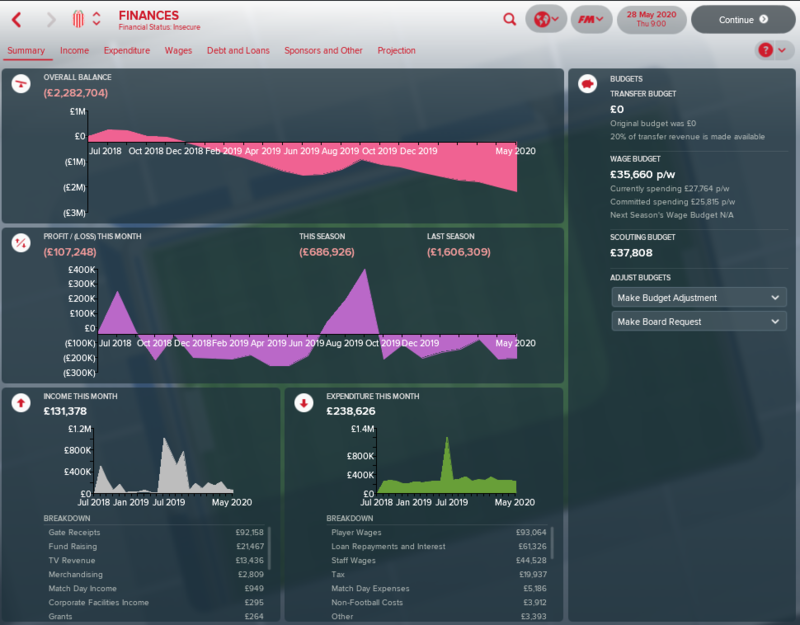 Finances looking great and we are way below our salary cap. 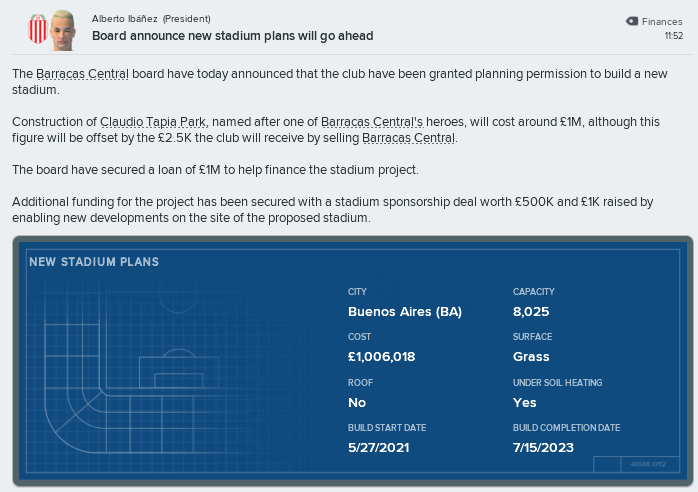 Considering that our stadium is pretty big and doesn't need much improvement I am hoping all that extra profit will go into facilities to be maxed out in the coming years. Next seasons expectations are pretty decent, and I think we are growing with babysteps which is good. And on a personal note, 200 games in management, not bad at all. We were top for a lot of the season but lost form and didn't recover however we won the European Play-Offs again. A great run however Feyenoord edged us in a game we could've won. Just 1 out on loan, some players left the club over the summer however not shown on this. I have a terrible habit of running out of steam playing this challenge, nevertheless I find myself here again, keen to join in. 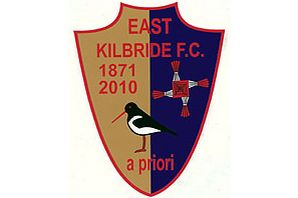 I have taken the reins at East Kilbride. They have a large squad and an infrastructure that lends itself to a challenge like this. Very tempted to start this, thinking somewhere like Austria or Switzerland would be different. After licking my wounds for the past week after my unfair sacking from Dulwich I'm back. Still in England but with another fan owned club in Marine. 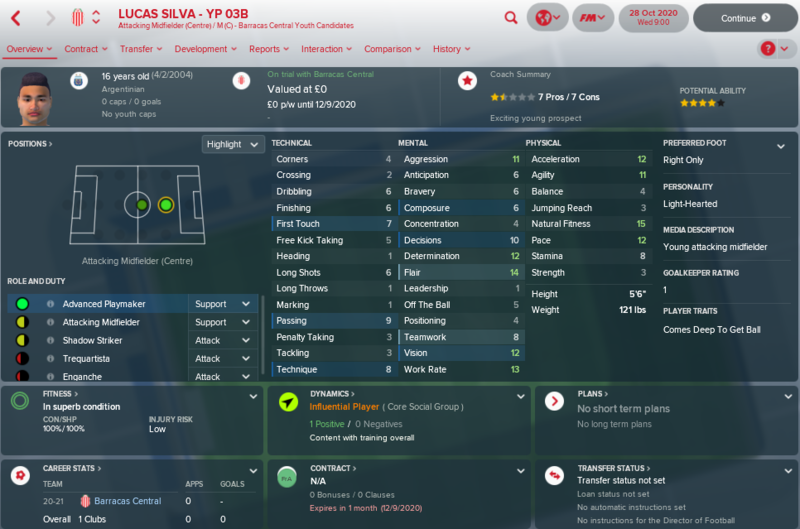 Transfer deadline day was uneventful for us, but River Plate just bought in a 34 yr old Edison Cavani in on a free transfer! 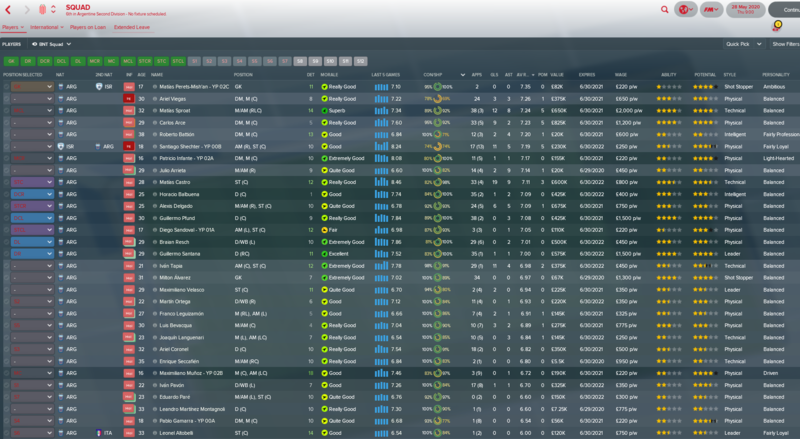 A middle of the road Youth Intake. Our top prospect was again a forward, sooner or later we are going to end up playing a 2-3-5 or something! Federico Fassi – YP 04A – A decent looking forward, with a light-hearted personality. This is the 2nd such personality in our intakes and the HOYD even mentioned his effect on him. 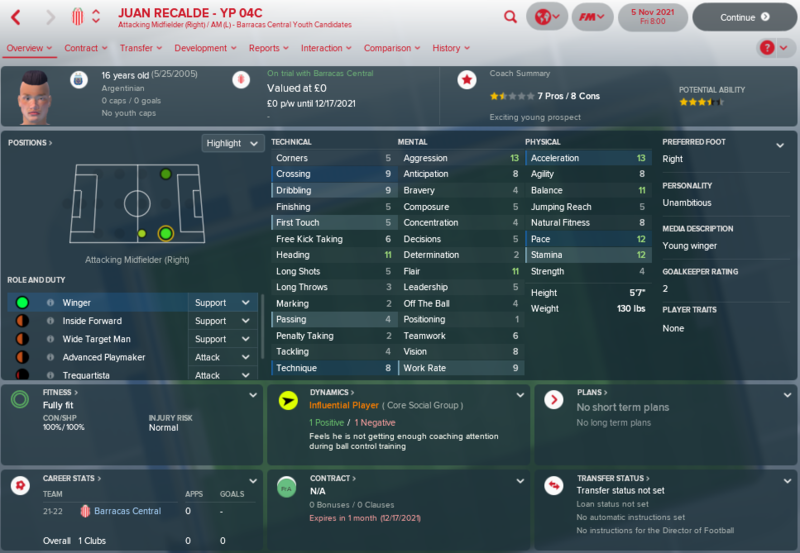 He has another 18 months on his contract and then it may be time to look for a new guy, even though his stats are nice. 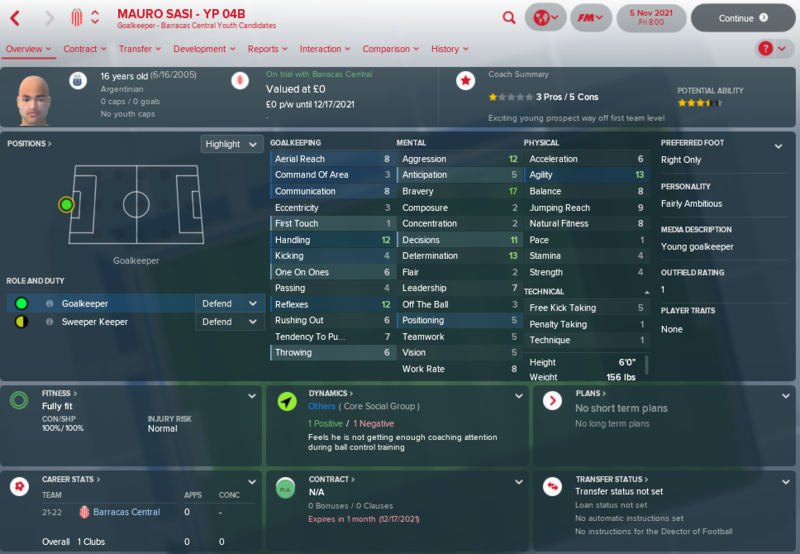 Mauro Sasi – YO 04B – A second high potential GK. 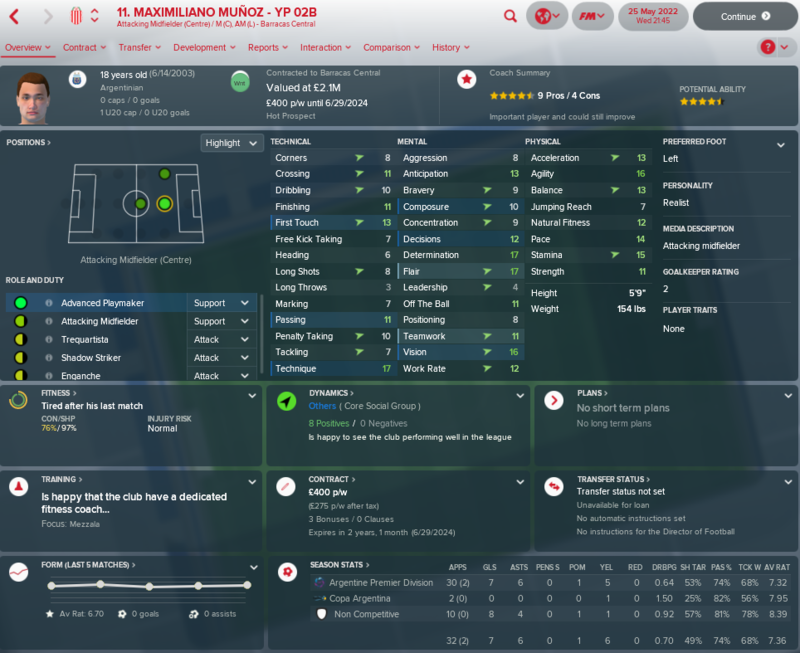 With our current youth product GK now in the 1st team and performing excellently, Mauro will have the youth set-up to himself to progress. Well this is is officially a rollercoaster season. Entering a month of friendlies during January and our league form has been fantastic, winning 5 and drawing 1. We ditched the tweaked formation we started the year with and reverted to our promotion set-up from last year. Shot back up to 5th in the league and hoping we can now stabilize. 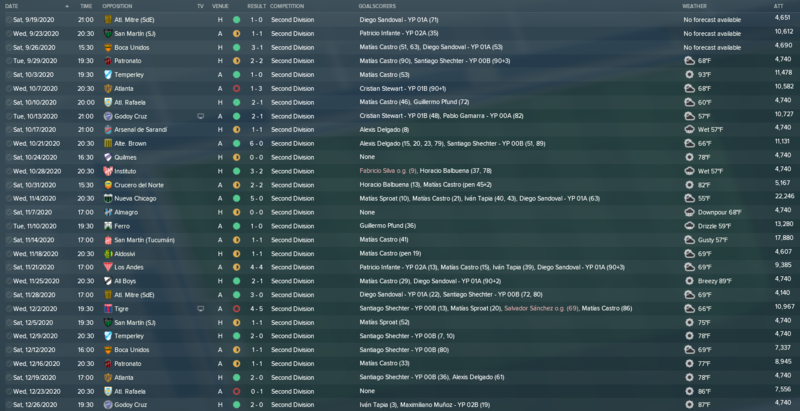 A fantastic showing in the 5th round of the Argentine Cup (our first round). 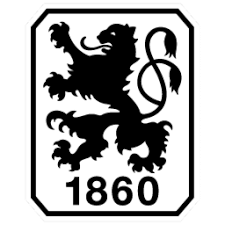 An 8-0 win against a non league team, with Santiago Shechter – YP 00B bagging 5! Mid-March and a couple of big milestone days. Patricio Infante – YP 02A & Maximiliano Munoz – YP 02B both feature for the Argentine U20s and Matias Perets-Mish'an - YP 02C gets his first full cap in goal for Israel! End of season form was great, winning 4 of our last 5 and to top it off we were playing more and more youths. Really getting into this team now. 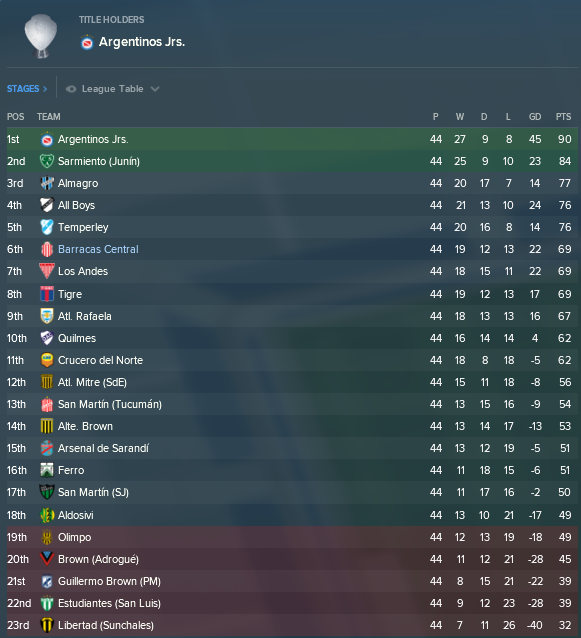 A final finish of 6th this year is beyond our wildest dreams and we have qualified for next years Copa Sudamericana (essentially, I think, the equivalent of the Europa League). A final day 5-2 win against our near neighbors Huracan saw Santiago Shechter – YP 00B score 4 more times, putting him into a 3 way tie for top scorer, which he won due to playing less games than the other 2! 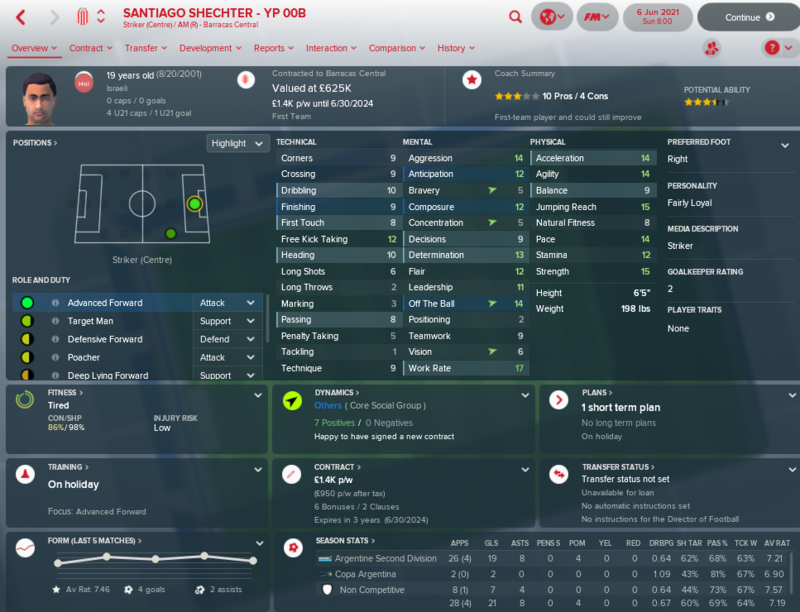 Santiago Shechter – YP 00B – Still our main attacking threat, although he is very streaky. 9 of his 26 goals coming in 2 games! I would be delighted with the same again! Continue the development of the club. We can now very safely field YP products at GK, all 3 MC and all 3 FC positions. 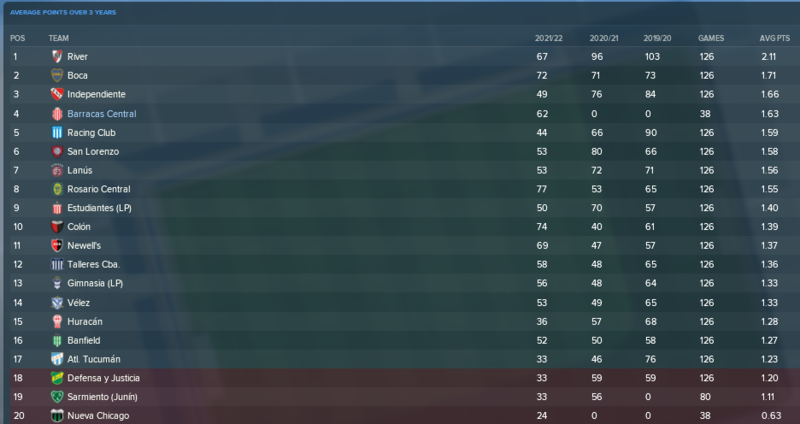 I had my usual end of season collapse (is it just me that seems to have this every year....?) picking up 8 points from my last 8 games - was 5 points clear of 4th with 2 games to go, but 2 defeats meant that I scraped up on Goal Difference. Seemed a really close league this year - I only accumulated 77 points and still went up. Seems like you need to save a few weeks before the 14th June. Get the same teams. Well this could be interesting, although the money will be good! I´m thinking about starting this challenge but I wonder why can I load only one nation? Is this because it´ll be more difficult when I´ll get youngster only from my nation? Thanks for any reply and good luck! It's actually easier in my opinion only loading you nation. I'm not too sure why that's a rule, but if you want it harder just load "players from top clubs" or that kind of stuff in the database options. It'll make it harder once you do the continental competitions. I think it was originally done to allow people with less than ideal PC's to participate and ensure everyone was running the same set up and think (assume) this was in the days before we could add players from top clubs. I could well be wrong. I just used the same rules previously used when I set the thread up. I know Dafuge has recently (last year I think it was) allowed other leagues to be loaded in his challenge so it might be worth thinking about in here as well. If that's what people would like? Bit like opening it up to outside of Europe. I opted to scrap my 442 during preseason in favor for a more aggressive 5212, similar to the one I used most frequently in FM17. More bodies in the defensive line along with an absolutely outstanding first season from rookie Eugen Pawlowski resulted in 1st place, totally dominating the league. My initial plan was to bring him in slowly as a replacement to veteran Sascha Mölders over the course of the season, but his blitzing pace and the inclination to play in his striking partner more often made all the difference for this team so by October he was the undisputable number one. Cedric Brust also featured frequently in the first team until a broken leg spoiled the remainder of the season for him i January. Got high hopes for him if he can stay injury free. Youth intake looks decent, although 7 out of 16 candidates shipped with Unambitious personality so there's definitely some tutoring to be done over the coming years. Guess the ambitious kids all went to Bayern and we simply got the bunch that settled for 3rd tier football for life. The highlights of this years intake were Babak Bürkle, Dominik Freytag, Bruno Colella and Leo Pledl. Transfers: Board sold Gerrit Langer for a **** fee at the end of the January window after I had failed to renew his contract due to wage restrictions. Apart from him all players out are rubbish. My hopes for next season is obviously to stay up, perhaps even a mid-table finish if the team is able to maintain some of the form of last season. Opposition is a whole lot tougher though so whatever keeps us in the league is fine. I had to promise a bunch of my prospects that we'd be in Bundesliga by 2023 to get them to agree to contract extensions, so a dropdown will probably mean that I'd have to start over with a new squad. 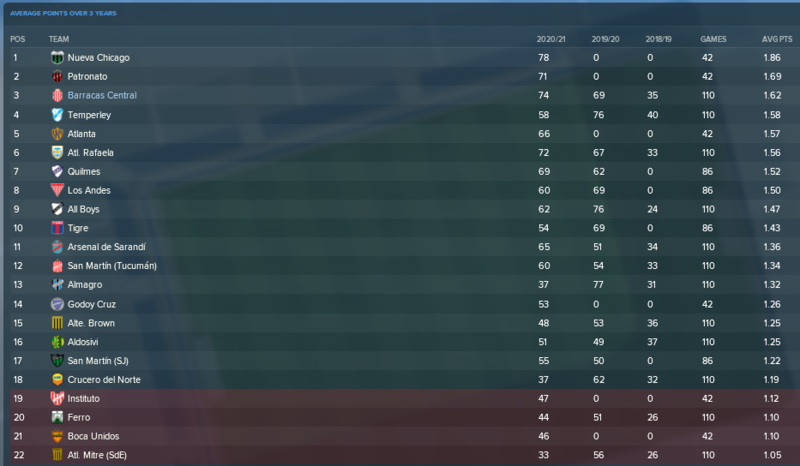 A mostly bad season where I finished a lowly 19th, although we did have the token 5 game run where we played really well and won 4 of them that essentially saved the season (and almost had me in the playoffs at one point). I again survived through the relegation playout, beating the automatic relegation that I was tipped for in pre-season. If I'm honest, there were large swathes of the season where I could see no future for the save. If results had gone against me on the last day I could have been automatically relegated, but we somehow avoided that by a point or two. Again, a late season change of tactics seemed to get me through the playout in commanding fashion.